Home > Popular Category > Bird Supplies > Bird Treat > Daily Select for Large Birds - 8 lb. 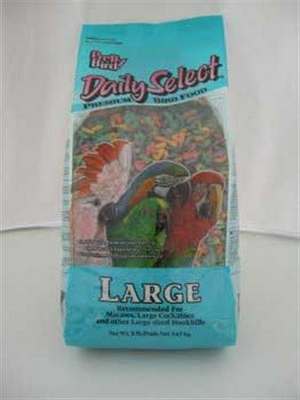 Daily Select for Large Birds - 8 lb. Not all bird food is created equal. Pretty Bird Daily Select is a cut above the rest. Formulated with colors, shapes, and fruity aromas to entice your bird, Daily Select has the perfect balance of nutrition and essential vitamins and minerals that your medium hook bill requires to live a long and happy life. This is a great food for everyday feeding. Crude protein (min) 14% Crude fat (min) 5% Crude fiber (max) 4% Moisture (max) 10% Ash (max) 4% Vitamin A (min) 17,500 IU/kg Vitamin D3 (min) 800 IU/kg Vitamin E (min) 200 IU/kg Copper (min) 10 mg/kg Recommended for macaws, cockatoos, eclectus, and other large hookbills.